We are now accepting deposits on these litters. Please Go Here when you are ready to place your deposit on one of these litters. We are excited to announce confirmation of our next three litters!! We are planning our next litter to be from Stella and Ziggy in early April 2015. This will be an F1B Litter. Both Stella and Ziggy have ideal temperaments for laid-back, puppies – great for families with small children. We expect these puppies to be goldens to reds and average 60-70 lbs. Also planned in spring, 2015 is Jasmine and Ziggy’s litter. This is a Parti Poodle Litter. We expect this litter to be creams to apricots, and average 70-80 lbs. With Jasmine’s and Ziggy’s gentleness with children, we are certain these puppies will fit into anyone’s home with kids. 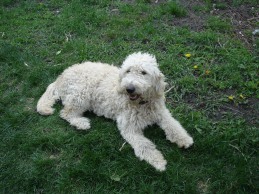 We are also excited Coconut’s second F1b Goldendoodle litter this summer. 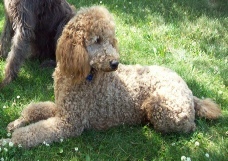 Coconut is an F1 English Goldendoodle. She truly is a giant Teddy Bear. She is very gentle, loving, easy to train, and obedient. Her coat is very soft and velvety, and she is an absolute beauty. 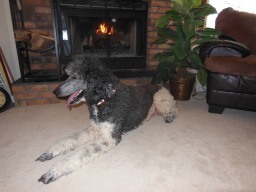 Cedric is a purebred Standard Poodle. We fell in love with Cedric the first time we met him, and there are very good reasons we chose him to sire both of our current litters!! He is sweet and gentle, very obedient and submissive, and I have Never heard him bark! We love having him around our children, and the temperament he brings to his puppies is ideal for the family-oriented puppies we are trying to breed. Buttercup is an English Golden Retriever. Her mother’s line is field champions, and her father’s line is all show champions. Though born in Canada, both of her parents are from Scotland. She is 65 lbs, and has a very meek, gentle spirit.